What is The Fastest USB WiFi Adapter for Windows 10? Having a wireless USB adapter that can transfer files very quickly is almost a requirement for some. With each release of new WiFi protocols there have been USB dongles that stand out as the fastest available along with reliability. The ASUS USB-AC68 Dual-Band AC1900 is one such unit, that is very impressive when it comes to speed and wireless connectivity. First of all this is not a low cost dongle so if you are looking to simply get online there are many cheap units available. 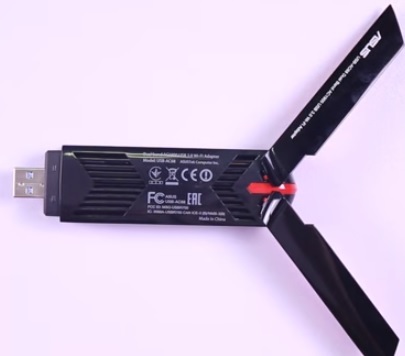 Having the fastest unit available is not needed by most, so unless you have a specific need for a fast wireless USB adapter for a desktop, or upgrading a laptop it is best to go with a good cheap unit. We have reviewed many such units which you can read here. The ASUS USB-AC68 is for those looking to have the fastest possible USB WiFi dongle available. To do the testing we used Windows 10 with a Core i5-4300U, running at 1.9 GHz, 8GB RAM and a 256 GB SSD drive. 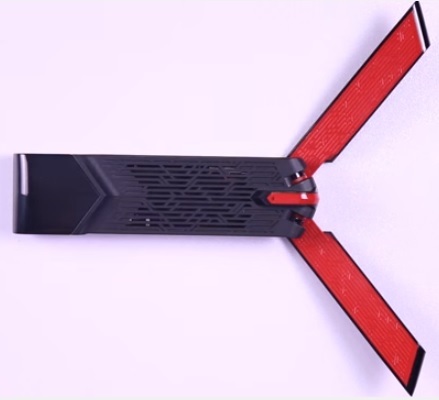 The first thing noticeable about it is the different design with two external antennas that fold out like a butterfly. The fold out antennas help to improve wireless coverage. It also comes with a USB cradle to extend it out if needed. The USB-AC68 uses Realtek RTL8814AU chipset which has the newest technology, 3×4 MIMO and AiRadar beamforming. 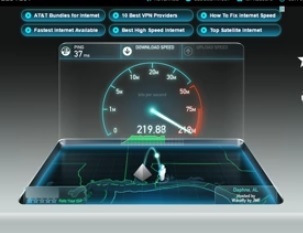 The theoretical speed is 1900 Mbps split between 2.4Ghz and 5 GHz frequencies. 2.4 Ghz at 600 Mbps, and 5 GhZ at 1300 Mbps. Of course theoretical speeds are never reached and anyone wanting the fastest WiFi possible will be using the 5 GHz range with 802.11AC. To test it we connected to Dlink 802.11AC router. ASUS does suggest using one of their newest routers for the best results. To test the speed we used a 300Mbps Down, and 50Mbps UP internet connection with speedtest.net. The download speed was at 219 Mbps. 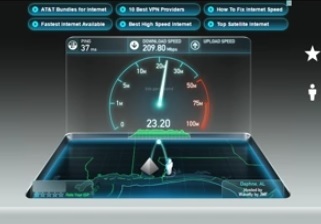 The UP speed was also good at 23 Mbps. The speed results were impressive, even beating out the fastest PCI card we have in a desktop. We do wish we had a new ASUS router to see if the result improved or not. The router was set 10 feet away with a clear line of sight. Keep in mind the more distance to the router the slower the time will be. When it comes to new USB wireless adapters it is rare that we get that excited about a new dongle. While each generation of USB WiFi dongles always are an improvement over previous versions the boost is often not that spectacular. The ASUS USB-AC68 Dual-Band AC1900 is an exception to that and was doubling and tripling speeds from other new WiFi dongles. It of course is also more expensive so may not be the best for everyone. Also we did see some reviews from others about installation problems. Mainly with USB 3.0 drivers. Another downside is no Linux support, at least right now there are no drivers. 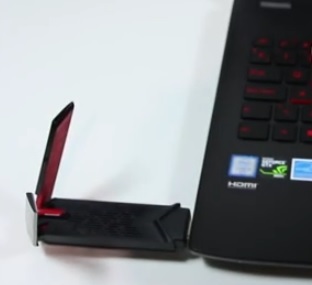 If you need speed from a wireless USB adapter and Windows 10 than the ASUS USB-AC68 will be tough to beat. I am currently using this antenna, and it is the best (and most “worth it”) antenna I have ever bought. This dongle only support 5Ghz channels 36-48 & 149-161 (UNII-1 & 3) and does not support channels 56-140 (UNII-2 or DFS channels). In other words, it only support 8 of 22 available 5Ghz channels in north America. Not sure why Asus opts to exclude DFS channels. That destroys the purpose 802.11ac wide channel configuration. I have nothing but trouble with this adapter and even exchanging it twice did nothing. It is what it is and how it works in my wireless environment is not going to change unless I were to make changes to my already optimized and fully functional network. It’s so smooth which is why I cannot figure out why I get more stable and consistent connections with the netgear 6210 and also Linksys’s WUSB6300 & 6400 adapters. All of these are in MUMIMO with Linksys MaxStream router and I have to say, this ASUS AC-68 is just a big disappointment. I do know that a wireless environent varies among different users and for what it’s worth, I believe the hardware I use with the best results may just not be the same on someone else’s network. All ratings and reviews should be taken with grains of salt because of these variations that most people never seem to admit when they plug different hardwafre in reviews. Referring to CNET and PcWorld and other sites like that. But thing is, if someone has the fastest result using a specific model WIFI adapter, immediately top review sites take that as the perfect opportunity to promote a product. 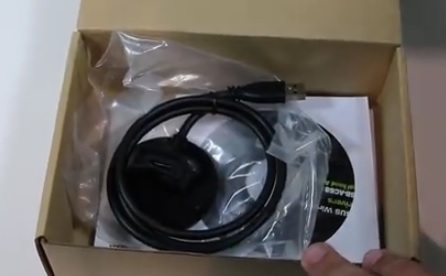 But, nobody wants to specifically outline the router they used, or even the computer they used the adapter in and other important details that often avoided. I can use someone’s review as a baseline but no way will I be able to know which piece of hardware, whether it be a router, adapter, AP, etc… unless I incorporate a new piece of hardware in MY SPECIFCV wifi environment. Because all of the wifi conditions in my home will not likely be a perfect match to anyone else’s, albeit, wireless adapters, APs, my router, TV remotes, iPhones, Android Phones, and whatever else that uses wireless channels and frequencies. And my neighbors sometimes have their wifi routers showing up as available networks on my systems. And although they are secured, there is no way of knowing if any channels they use overlap my channels. It takes alot of know how to manitor and finesses aettings on wifi equipement on the admin level, just to keep good steady flow in a congested atmosphere. SOme people have it good with not much interference and what not. But unless you are just a one man band, using a client adapter by yourself in a scenario involving just you and a wifi adapter and wireless router, most reviews will just not apply. I have a huge network demand with at least 5 laptops and desktops, and everyone in the house who is using a computer to stream, watch TV, or just surf the web is also dabbling on their smartphone yappping away with their friends. 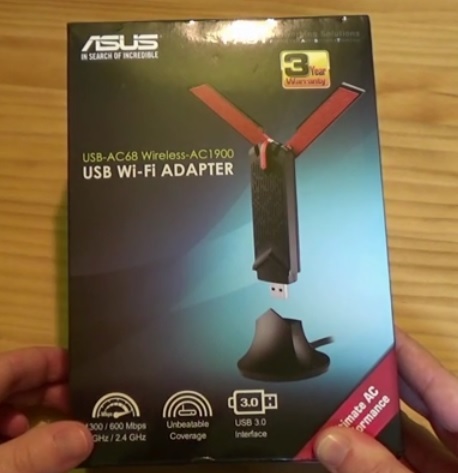 So I have to say that in a busy home, this ASUS adapter is a huge disappointment because of occasionnally losing connection, requiring me to pull the adapter and plug it back in. It does not stream video as smoothly as the Linksys adapter althouth the linksys adapter cannot match the download speed of my netgear A6210. The ASUS AC68 lags big time on my network. ASUS USB-AC68 Dual-Band AC1900 will support upgraded windows 7. Actually I have a laptop with windows 7 and then I upgrade laptop. My usb port is not working properly. Sometimes it works. Does this wireless adapter have the ability to enter monitor mode and to inject packets and capture packets simultaneously? Hey! Quick Question what is the difference between me getting the PCIE and the USB version for a PC (I am running windows 10)? I apologize if its a dumb question but I am looking at cost here but as well as wondering if I should just put in the extra money for it. Going to wait for blackfriday/cyber monday for deals! PCIE is a card type that slides into a Desktop computer, this requires opening up the computer case and installing it. Installing a PCIE card is easy but many prefer a plug-and-play option like a USB wireless adapter. It comes down to preference and what fits your setup and skill level.